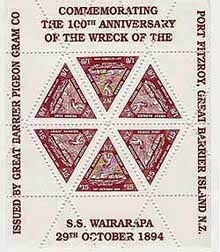 Virtual New Zealand Stamps: 1894 The Wreck of the SS Wairarapa. In the third worst shipwreck ever in New Zealand waters, 121 lives were lost when the Union Steam Ship Company steamer SS Wairarapa struck Miners Head, on the northern tip of Great Barrier Island, 90 km north-east of Auckland. As the island’s only contact with the outside world was via a weekly steamer, news of the shipwreck took three days to reach Auckland. This highlighted the need for better communication between the island and the mainland. A need that would eventually lead to the Great Barrier Pigeongram Services. Covers Salvaged from the Wreck. This is 1894 cover that was salvaged from the Wreck of the Wairarapa. 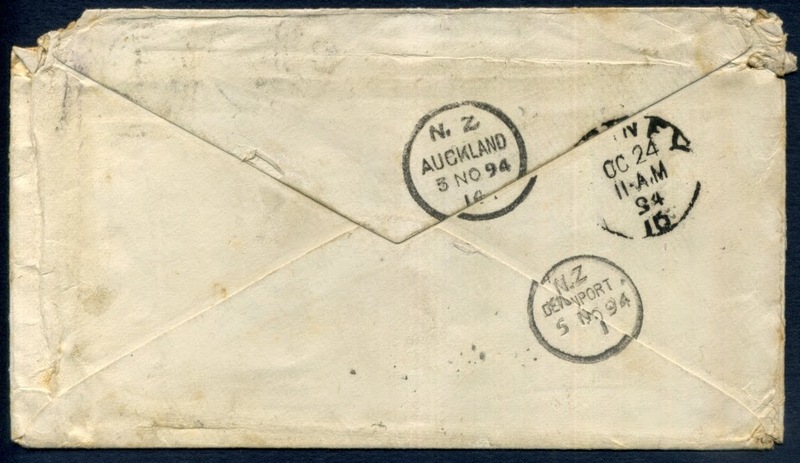 It was sent from The Exchange Sydney, Australia to Auckland, New Zealand on 24th October 1894. It shows water damage from being submerged and its stamp has been washed off and lost. 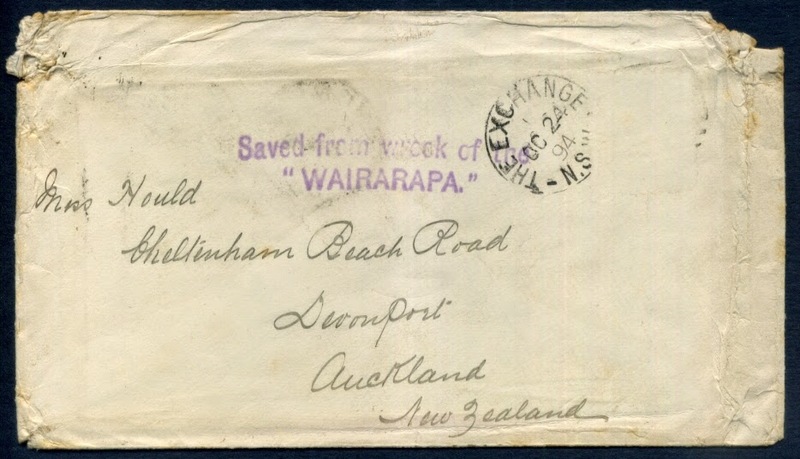 Notice the hand stamped words "Save from the wreck of the Wairarapa" in violet ink. The front can be seen above and the back seen below. One popular aspect of stamp collecting is to display your stamps or postal items in Stamp Exhibitions. 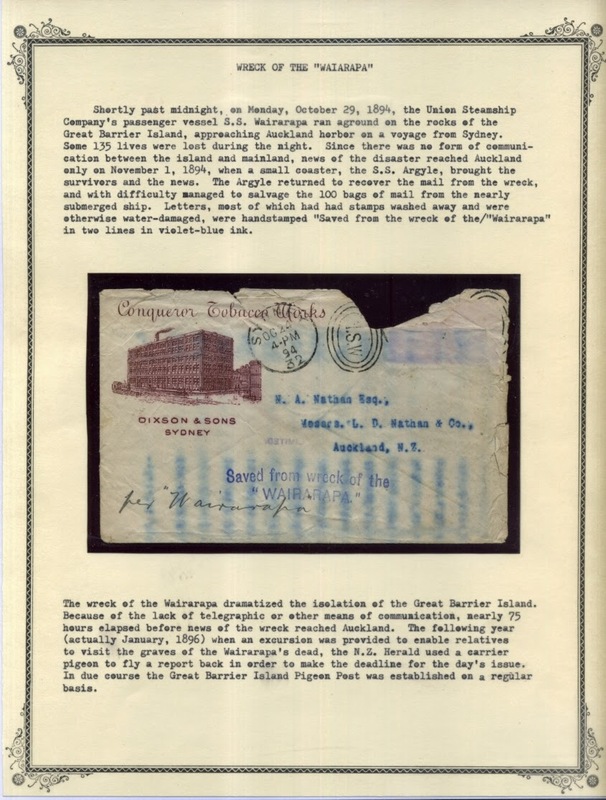 The stamps are usually displayed on neatly written up pages such as the one seen below. We do a similar thing as we create pages in this blog. The main theme of this exhibition page is another cover from the Wreck of the SS Wairarapa. This disaster highlighted the need for better communication between Great Barrier Island and the mainland. In 1897 this need was met by the establishing of two Pigeongram services run by two different companies. Some of the stamps used by these two companies can be seen below. For more on these see our post - Great Barrier Pigeon Post. 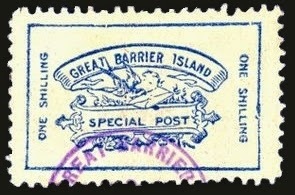 Stamps used by the Great Barrier Pigeongram Service. 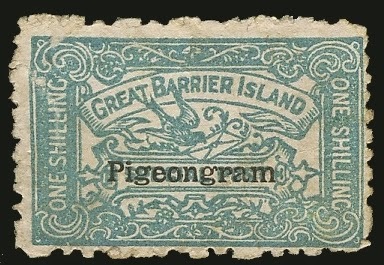 Stamps used by the Great Barrier Pigeongram Agency. 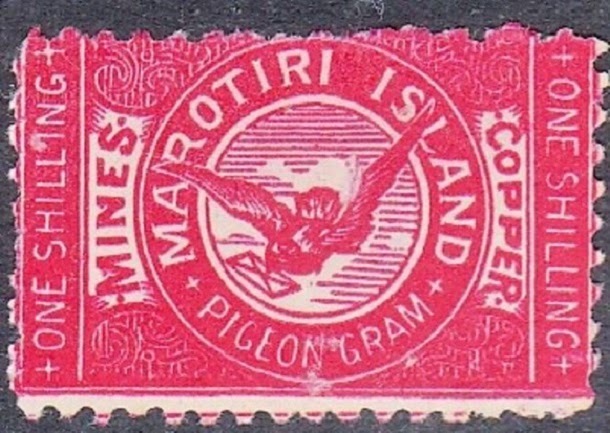 Used for the Pigeongram to Marotiri Island. 1994 100th Anniversary of the Wreck of the SS Wairarapa. 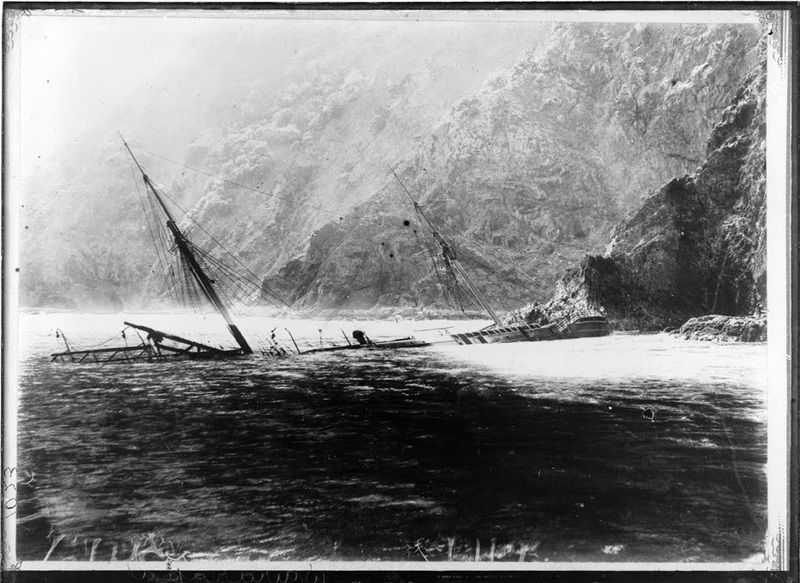 On the 29th October 1894, the SS Wairarapa became wrecked on the northern end of Great Barrier Island. This miniature sheet was issued 100 years later in 1994. It was not valid for normal postal, use being mainly as a collector's item. Nice post Mary but I would like to see more about the ship. I understand your point Asami but that was not my purpose for this post. You will see there is more about the wreck on the exhibition page I have included. For me of more interest are the covers that were salvaged and the link between this ship-wreck and the establishment of the Great Barrier Pigeon Post. Is it likely the Pigeon Post would have been established anyway, without the wreck? You might be right there, it may well have eventually happened. I am certain that the idea of sending the news back to Auckland with a report on the relatives visiting the graves of their loved ones via pigeon the following year, opened up peoples eyes to the possibility of using pigeons.